Note: The data in this report come from Pew Internet Project surveys conducted throughout 2010, which were bundled together to collect a statistically meaningful population of those who said they attended community college, four-year schools, and graduate schools. For more information about the samples, please see the Methodology section at the end of this report. When it comes to general internet access, young adults of all stripes are much more likely than the general population to go online. 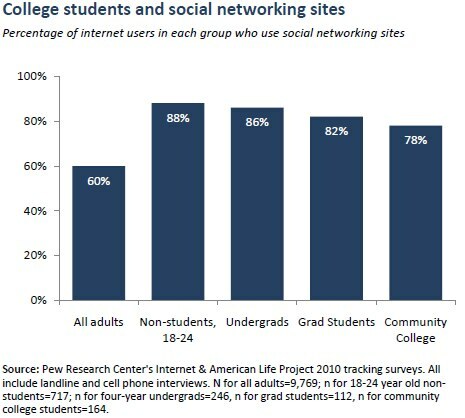 Fully 92% of 18-24 year olds who do not attend college are internet users, comparable to the rate for community college students and just slightly lower than the rate for undergraduate and graduate students (nearly 100% of whom access the internet). Undergraduate and graduate students differentiate themselves more clearly when it comes to home broadband access, as more than nine in ten undergraduate (95%) and graduate students (93%) are home broadband users—well well above the national adult average of 66%. 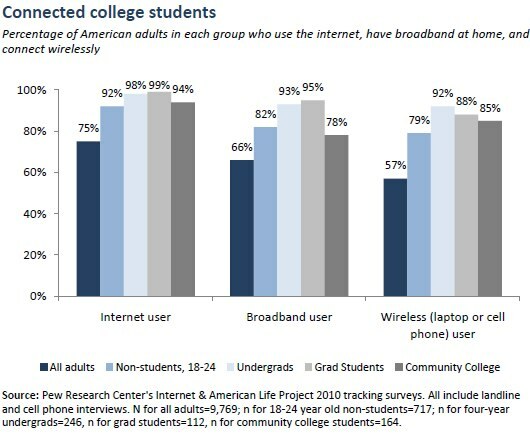 Community college students (78% of whom are home broadband users) and young non-students (82% of non-students in the 18-24 age cohort are home broadband users) adopt broadband in comparable numbers—both have higher adoption rates than older adults but lower adoption rates than students in undergraduate or graduate institutions. When it comes to accessing the internet on a mobile device such as a laptop or cell phone, young non-students (79% of whom are wireless users) are a bit less likely to go online wirelessly than either undergraduate or graduate students, but notably more likely than the overall adult population to do so. These differences in wireless usage between students and non-students are largely driven by differences in laptop computer ownership. School attendance has little correlation with social media usage, as young adults use social networking sites such as Facebook or LinkedIn at roughly similar rates regardless of educational attainment—although non-students are a bit more likely than community college students to use these sites. 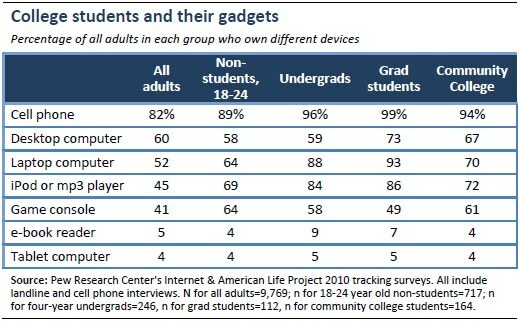 Young adults—students and non-students alike—own a wide range of gadgets at high rates compared with the overall adult population, although there are some areas where undergraduate and graduate students stand out from the pack. Specifically, undergraduate and graduate students are more likely than both community college students and college-aged non-students to own a laptop computer and an iPod or other mp3 player. Graduate students also have relatively high levels of desktop computer ownership compared with their peers, while undergraduates are more likely than average to own an e-book reader. We measure overall wireless connectivity in two ways. One way is by asking users if they connect through wireless cards in their laptops. Most people of all ages who own laptops now do this. The more striking difference appears in the second aspect of wireless internet use – through mobile phones. 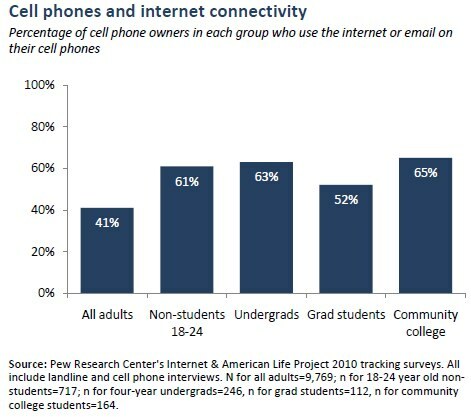 College students are much more likely than the overall cell owner population to use the internet on their mobile phones, although all young adults do this at a relatively high rate regardless of student status.